I started a 30 Day clean up series on my personal instagram account at the beginning of the month, and it has challenged me to face all of the things I have been procrastinating on. Many times our physical spaces can be a reflection of the mental or emotional chaos or clutter we feel. I wanted to make room for a peace filled December, and in the process, this list brought to attention some things I didn’t even realize about myself. When we can peel away layers, find quiet, and learn how to important the calm is, we may actually find the roadblocks keeping us from peace. It isn’t too late to print this out, and go through it this month so you can head into the new year feeling rejuvenated versus exhausted and overwhelmed. 1. Make a list of all the things taking up space in your life. (Physical, mental, and even emotional clutter.) These will become your priorities to clean up and address throughout the month. 2. Now that you have made note of everything that you want to address, write your list of priorities! What do you want to make room for in your life? Maybe it’s more time with certain family members, more time for service, prayer/mediation, or physical exercise. Write them down and keep them somewhere you can see! 3. Identify the unnecessary time eaters in your life. If they aren’t contributing to your priorities or making a positive impact on your day, consider adjusting, cutting back, or changing it up all together. 4. Take a look at your week, and pencil in time to declutter all of the physical spaces in your home that you have been avoiding. Do the surface cleaning prep so you are ready to deep dive. 5. 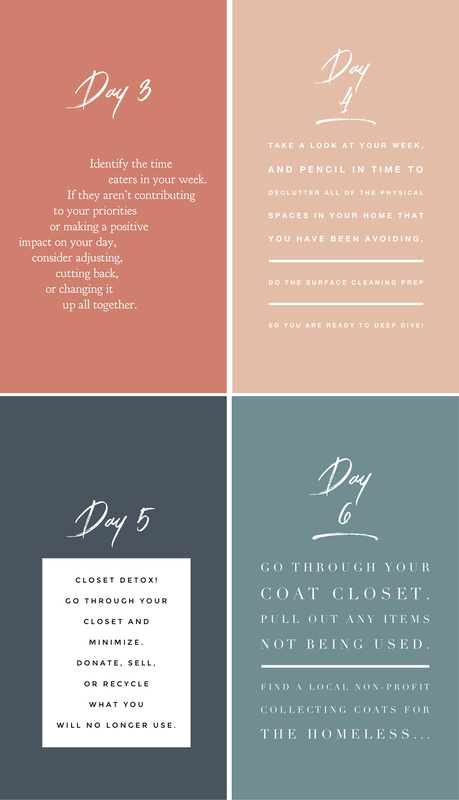 Closet Detox! Go through your closet and minimize. Donate, sell, or recycle what you will no longer use. 6. Go through your coat closet. Pull out any items not being used. Find a local non-profit collecting coats for the homeless. 7. Moving on to the linen closet – rearrange, fold, and minimize. Donate any unused items to the same organization as your coats. 8. Go through your dresser drawers, dresser tops, nightstands, or any bedroom areas that need organizing to create a calm environment you can actually relax in. 9. Bathrooms – declutter drawers and find organization solutions for makeup and personal care products. 11. Go through the toy bins and baskets, and put aside what is broken and no longer used. Encourage your kids to find a few gently used items to donate to a local thrift store. 12. If you have a desk or work space at home, clean and organize until it is an area that will give you a little motivation to actually use! 13. Clean out and de-clutter your car. 14. Set up a folder system for your mail. Go through old mail stacks and organize into folders. 15. Create a folder (physical or online) to file receipts in. It can be in the same file box as your mail organization. 16. Budget organization – Update your budget and have a list of possible expenses for December so it doesn’t cause unexpected stress. 17. Pantry clean out – toss expired food, and donate excess to your local food pantry. 18. Medicine and spice cabinet organization – go through and toss expired prescriptions or empty containers. Re-organize. 19. Meal plan at the start of your week. Make a list of all items needed for a week of meals to save extra trips to the store, and avoid the stress at dinner hour. 21. Organize your email inbox! Create folders, file emails, and create systems. 22. Declutter your laptop or desktop computer, and find a screensaver that gives you a positive reminder. 24. Commit to a journal or space for writing a gratitude list you can add to each day throughout December. 25. Carve out a ten minute break each day for quiet, meditation, or prayer. 26. Write your priorities for your week, and have them in view. These are your reminders for when the to-do lists don’t get done. 27. Photo organization. Print those photos you’ve been meaning to, or set aside time to make photo books for family or grandparents. 28. Clean up and organize any other cluttered corners in your living spaces that cause you stress. 29. Bring out some simple decor, lights, and greenery that make you happy. Create a corner that brings you peace where you can start and end your day. 30. Write out your greatest hope for the holiday season. Keep it somewhere you can see, and take small steps to work towards it this December. Of course adjust this as you need and what is relevant to your life. I would love to hear how this goes for you! 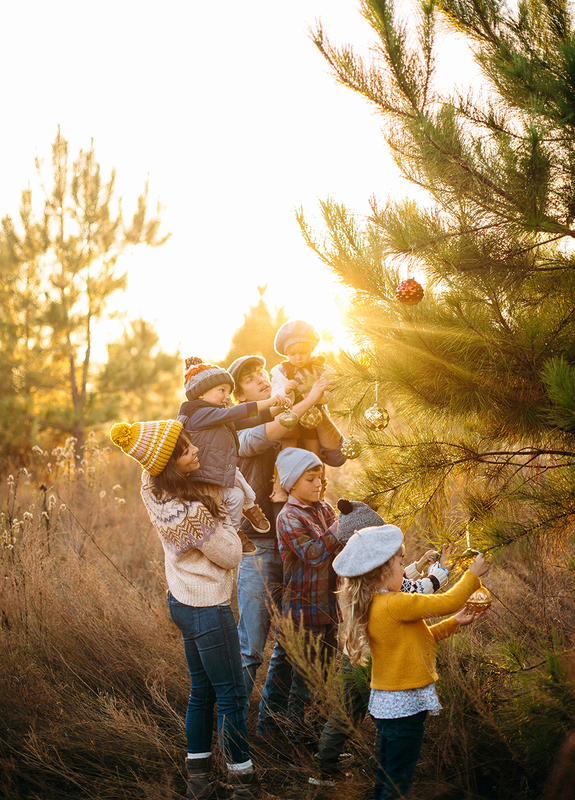 Wishing you a restful and PEACE filled December! Love this! I may practice this through December to get ready for the new year like you had suggested. 🙂 I had recently just realized that I had to start paring back some ‘clutter’ in my own life, so I’m excited to see how this well help my focus. Once I started I realized there was so much I was procrastinating on! I am looking forward to continue the time of cleaning out and rest! My family and I are getting ready to move so this list will help as we finish our packing and settle into our new space. Will have to save for next year as I’m sure this won’t be a one and done! Thanks!! Thank you Jess! Good luck with the move! I agree…this can be spread out for months!